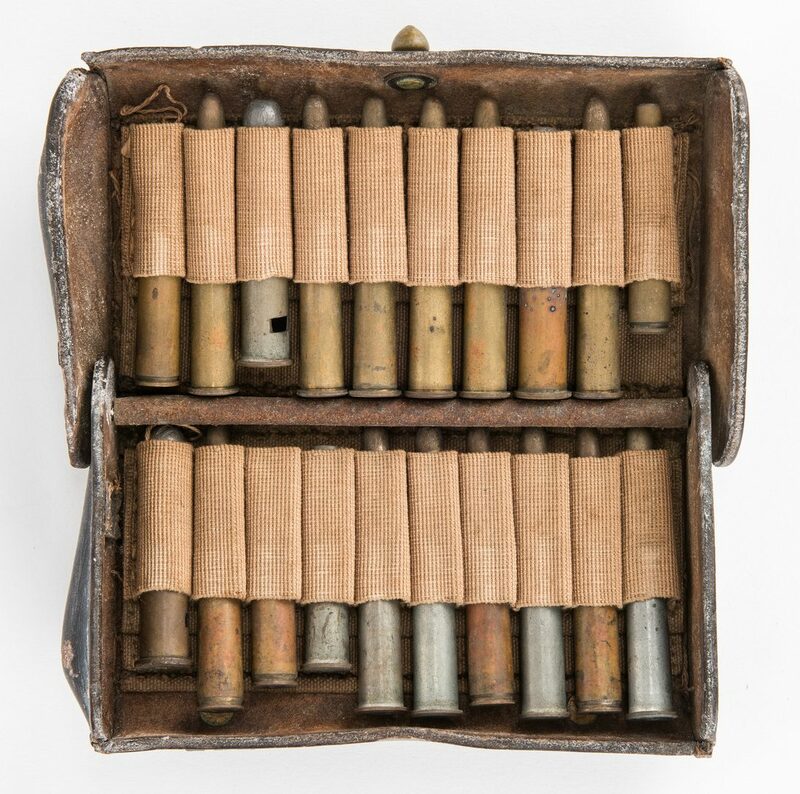 Group of nineteen (19) Civil War and later items, including belt plate, buttons, cartridge box, and more. 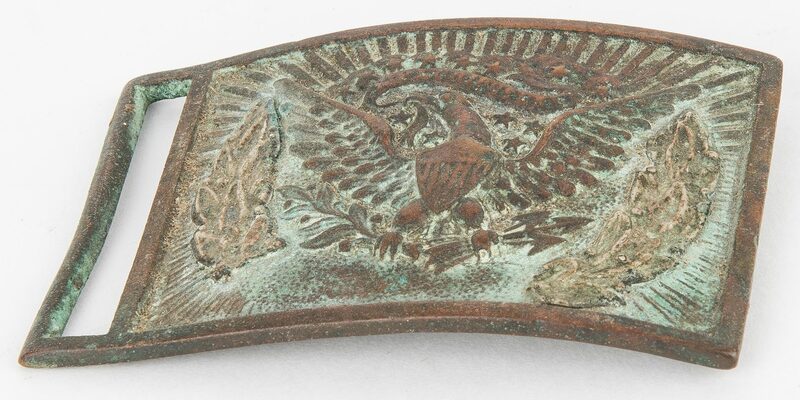 1st item: U.S. Pattern 1851 Officer's federal eagle cast brass belt plate. Depicts the seal of the Great Seal of the United States. 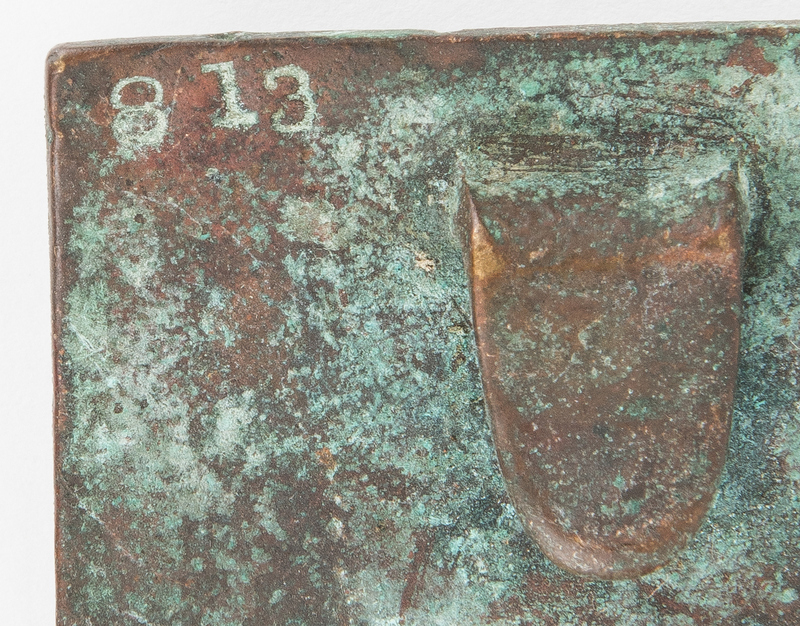 Back numbered "813". 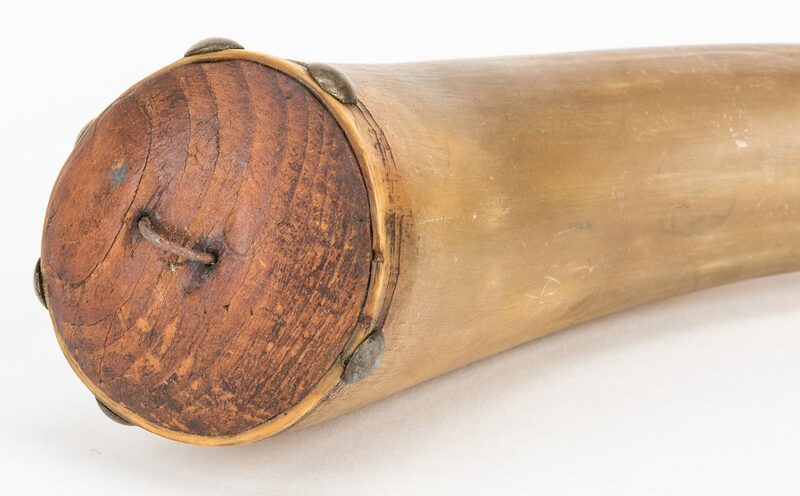 2 1/4" H x 3 5/8" W. Mid 19th century. 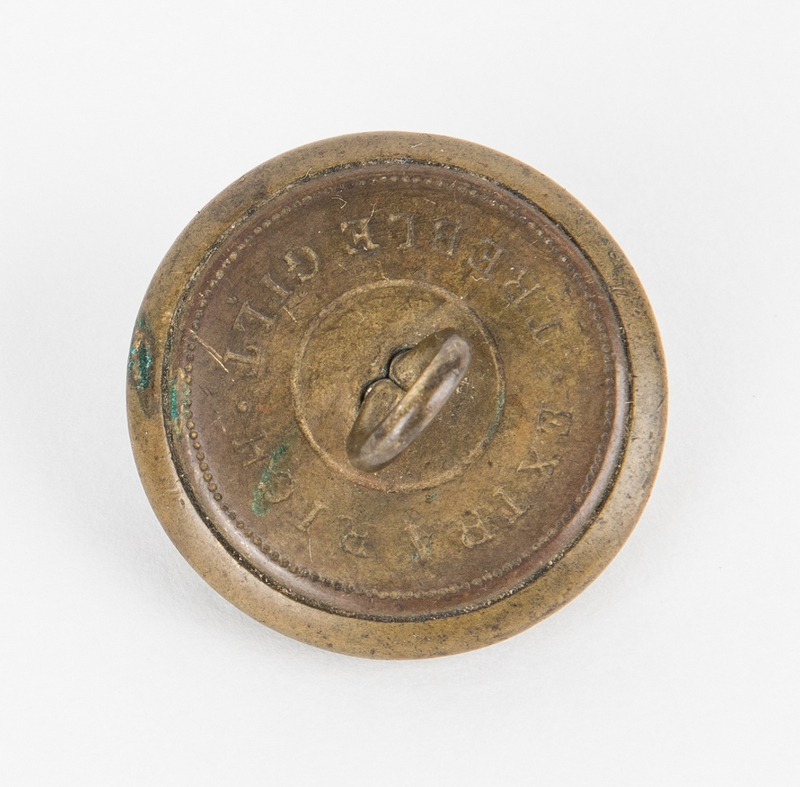 2nd item: One (1) Civil War Confederate Officer's brass coat button. 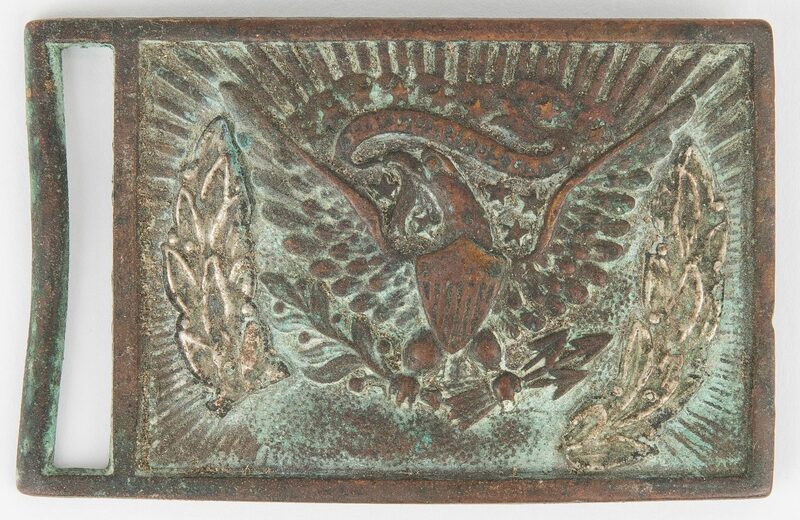 2-piece construction, depicting an eagle facing right with 11 stars on a lined field with border. Manufacturer's marks for Extra Rich Treble Gilt stamped, en verso. Approximately 22 mm dia. 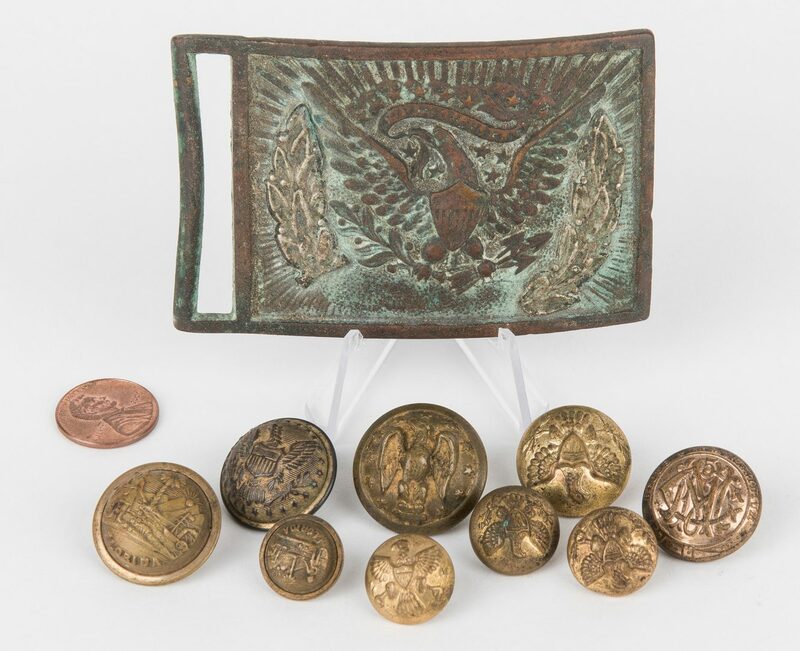 3rd item: One (1) Civil War Union Officer's federal eagle brass coat button. 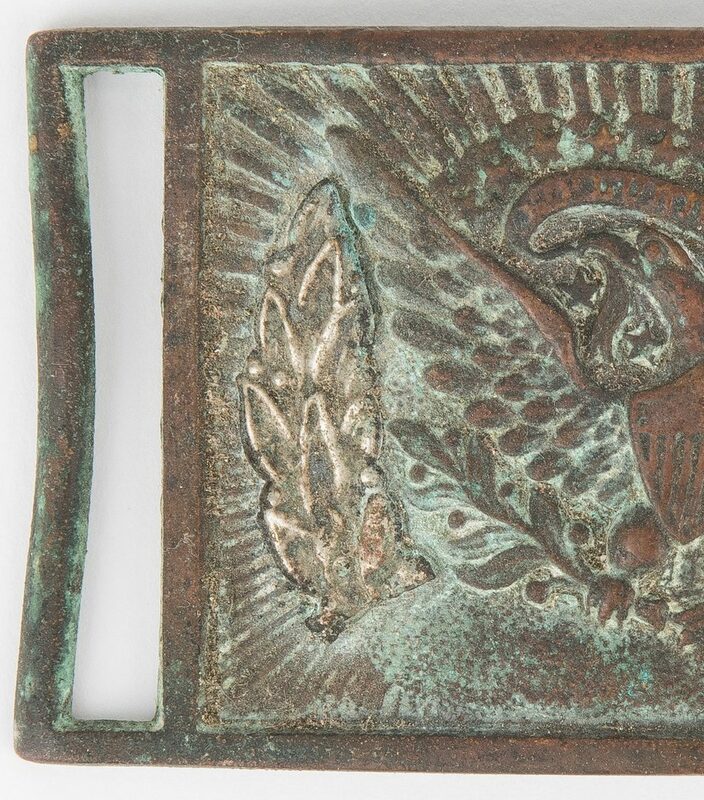 2-piece construction, depicting the seal of the Great Seal of the United States. Waterbury Button Co. manufacturer's marks Extra Quality stamped, en verso. Approximately 22 mm dia. 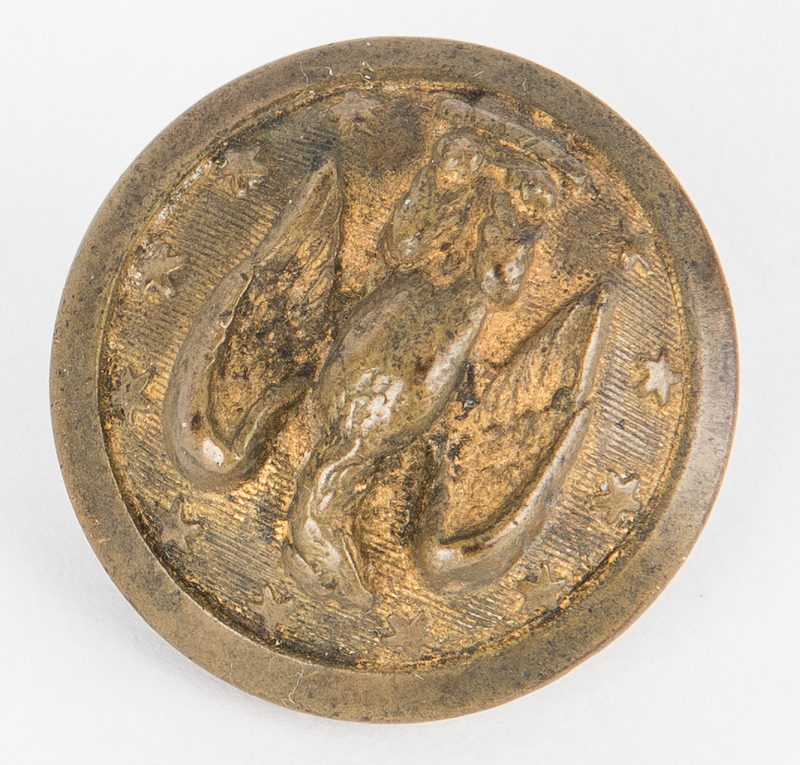 4th item: One (1) 175th Infantry Regiment "Fifth Maryland" brass coat button. 2-piece construction, depicting the overlapping initials "MANG" representing the Maryland Army National Guard, the number "5", and the motto "Decus et Praesidium" (An Honour and a Guard). Manufacturer's marks for N.Y. Clothing House, Baltimore, MD stamped, en verso. Approximately 21 mm dia. Late/early 20th century. 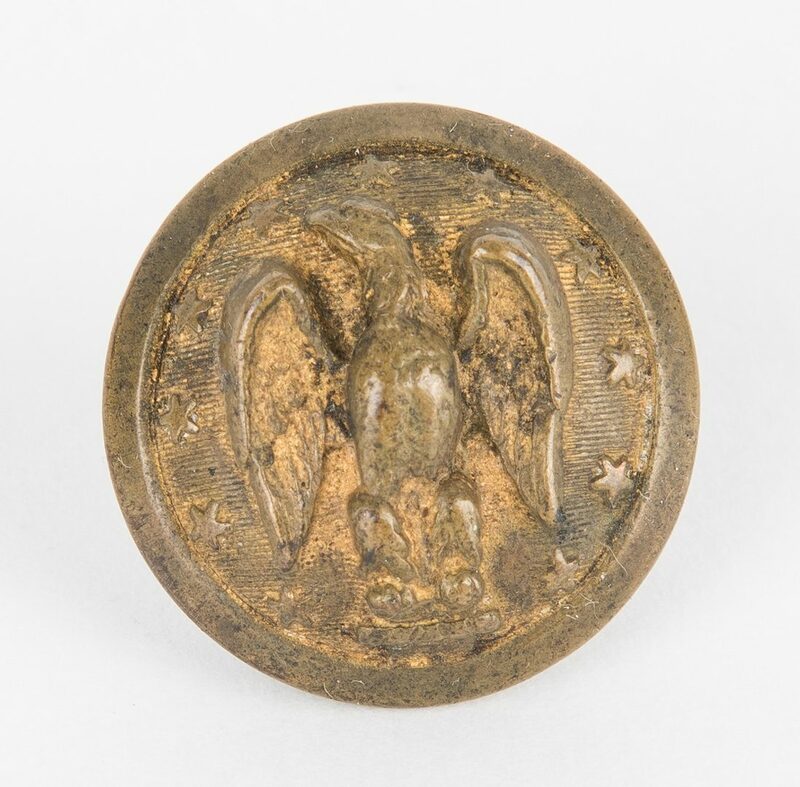 5th item: One (1) U.S. Federal eagle brass coat button. 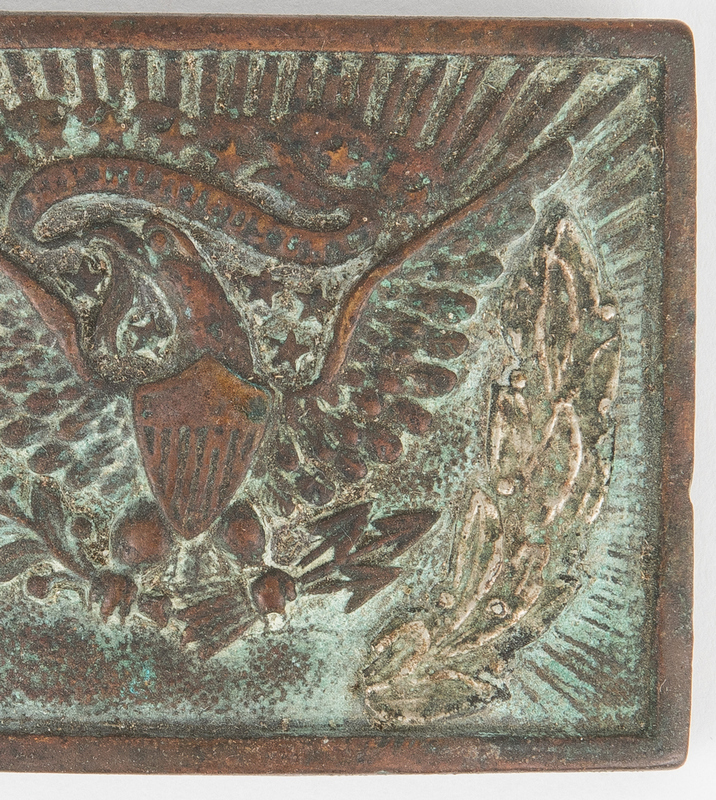 2-piece construction, depicting the seal of the Great Seal of the United States. Manufacturer's marks for Waterbury Button Co stamped, en verso. 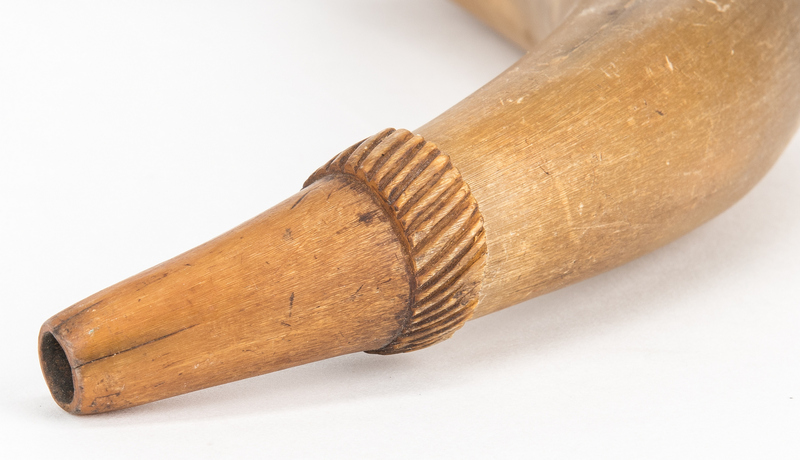 Approximately 19 mm dia. Late/early 20th century. 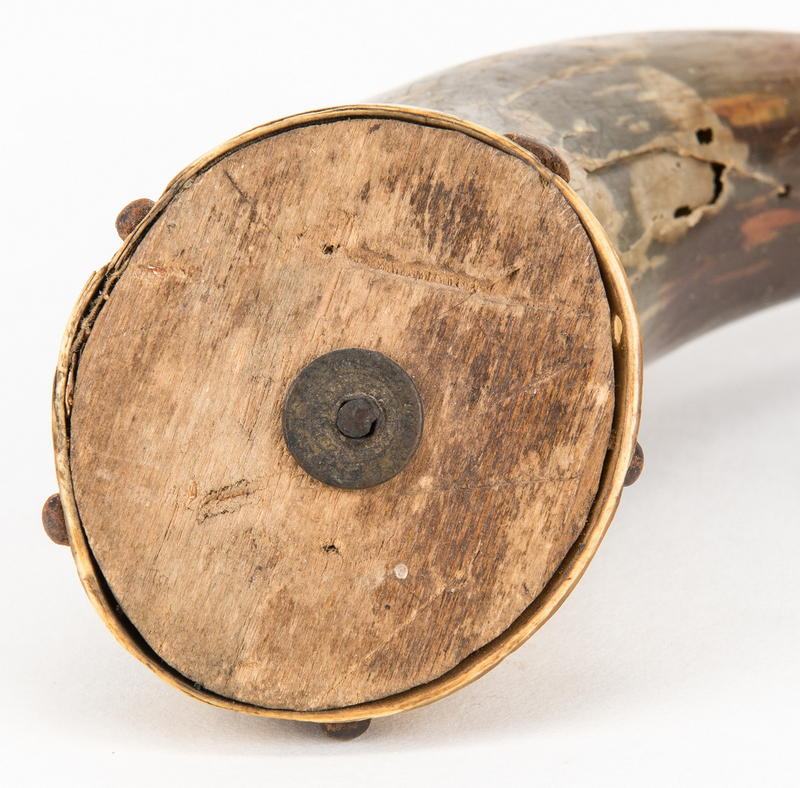 6th-7th item: Two (2) Florida brass buttons, including one (1) coat button and one (1) cuff/sleeve button. 3-piece construction, depicting the state seal of Florida. Coat button with ten stars, cuff/sleeve button manufacturer's marks for Horstmann Bros. & Co Phil. stamped, en verso. Approximately 11 mm to 22 mm dia. Late/early 20th century. 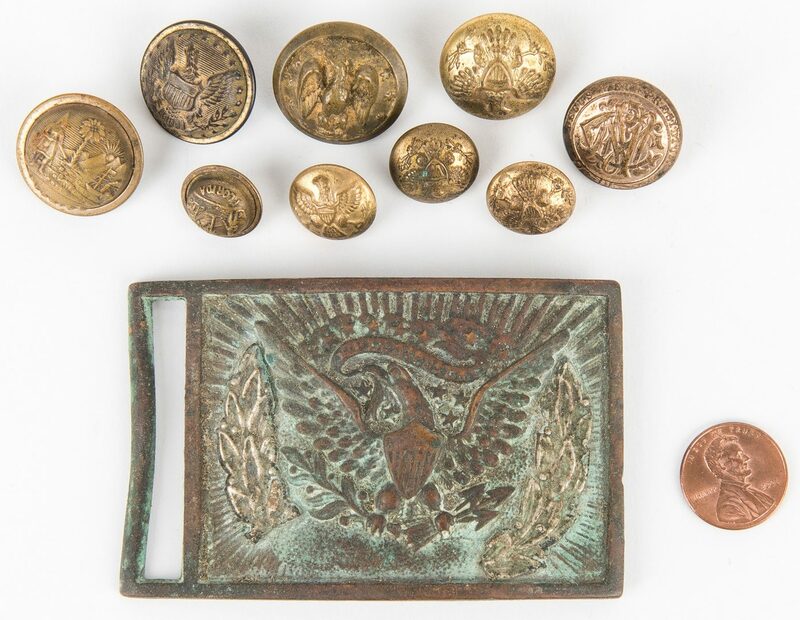 8th-10th items: Three (3) U.S. Federal eagle brass cuff/sleeve buttons. 2-piece construction, depicting the seal of the Great Seal of the United States, one (1) with a "W" to the shield. One (1) with manufacturer's marks for Scovill Waterbury, one (1) with manufacturer's marks for Horstmann Philadelphia, one (1) with manufacturer's marks for Waterbury Button Co stamped, en verso. 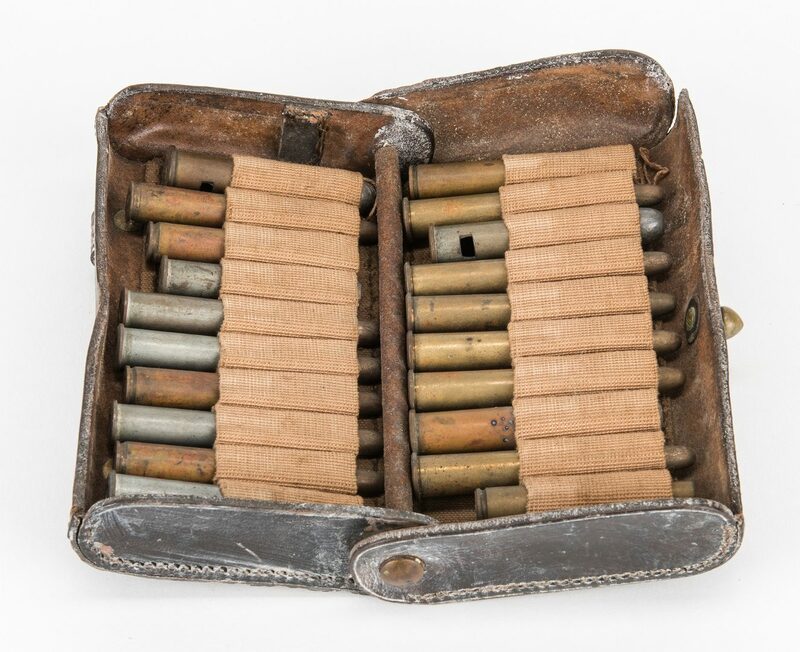 All approximately 19 mm dia. Late/early 20th century. 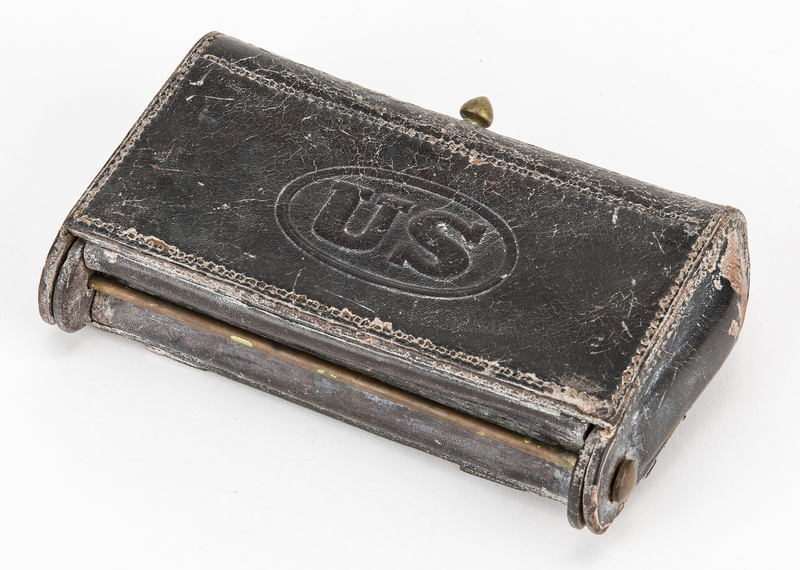 11th item: U.S. Model 1872 or later black leather hanging cartridge box with twenty (20) cartridge shells. 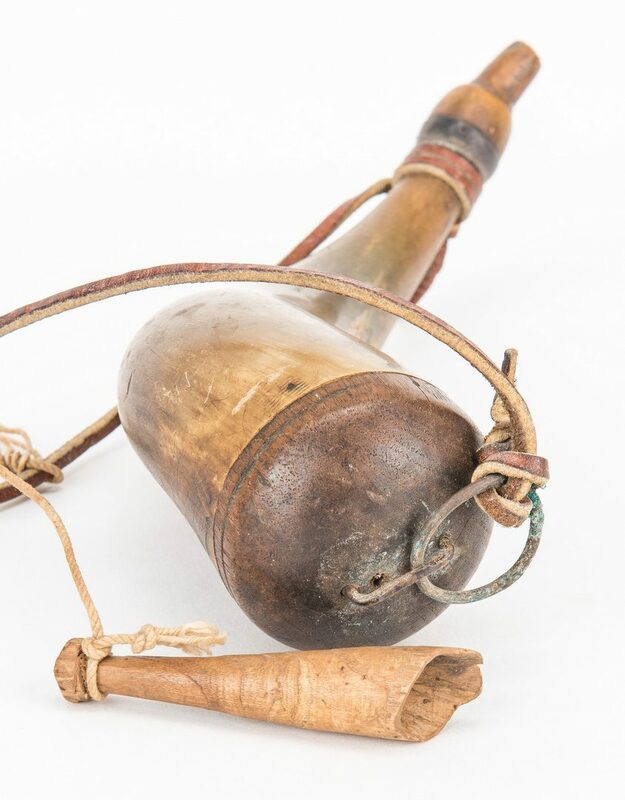 4 1/2" H x 7" W x 1 5/8" D. Late 19th century. 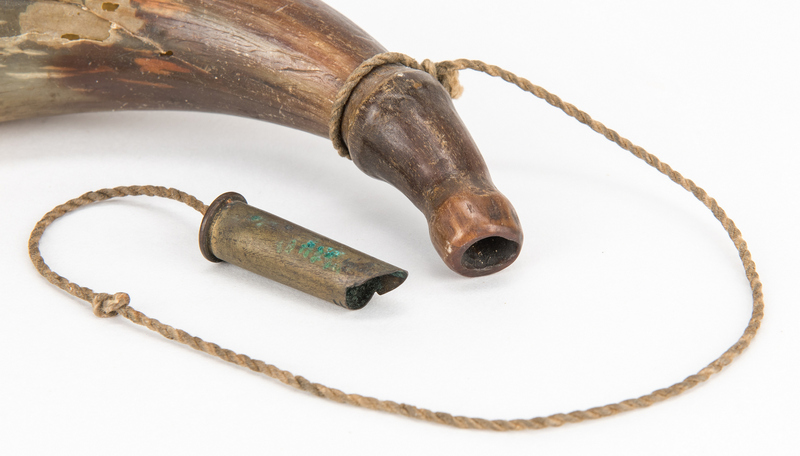 12th-15th items: Four (4) American powder horns, one (1) with leather cord strap, one (1) with twine cord strap and brass cap. 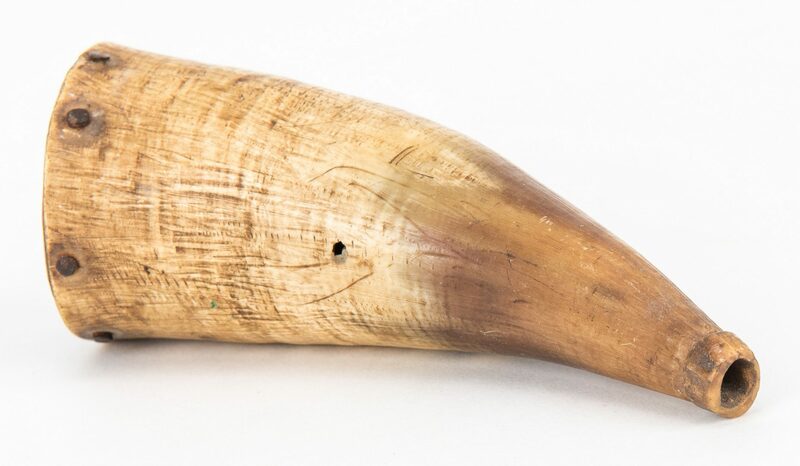 Ranging in size from 5 1/2" L to 10 1/2" L. 19th century. 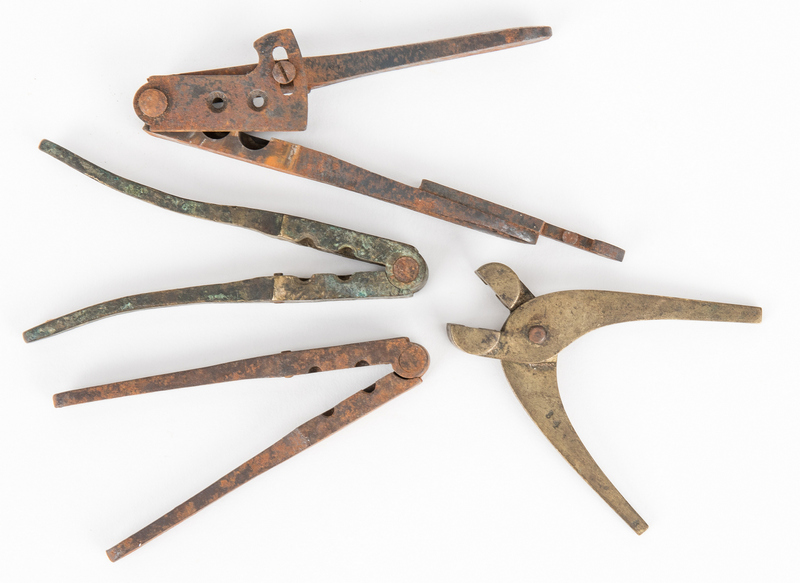 16th-19th items: Four (4) iron bullet molds, unmarked. 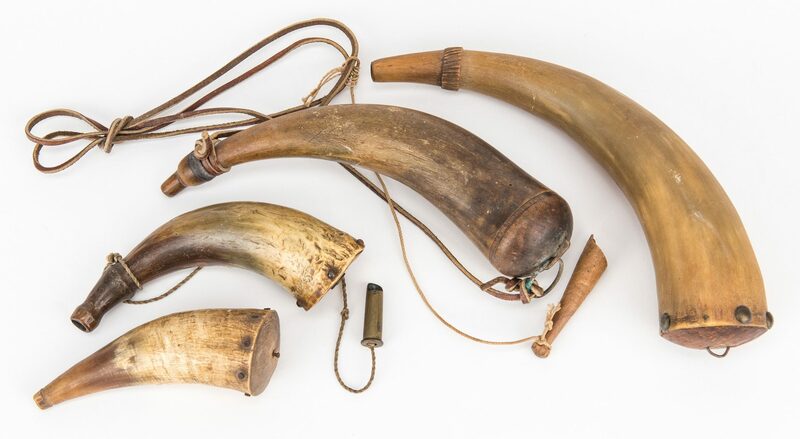 Ranging in size from 3 3/4" L to 5" L. 19th century. 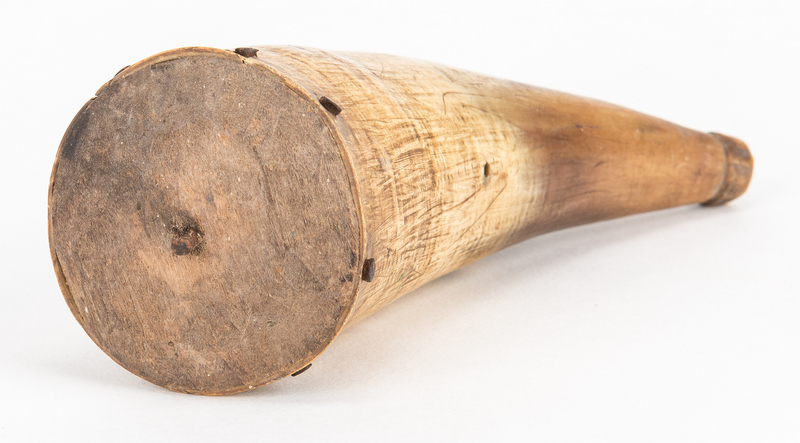 Provenance: the collection of Benjamin Dysart, Brentwood, Tennessee. 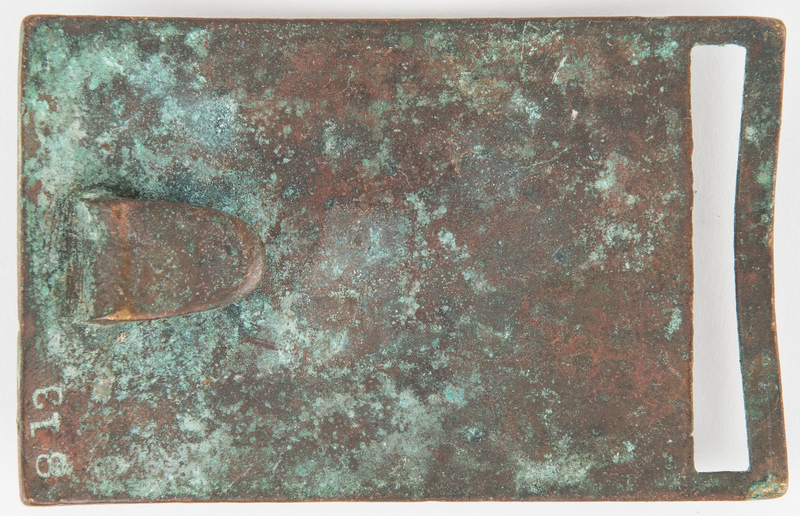 CONDITION: 1st item: Areas of oxidation to recessed areas of plate. Does not include keeper. 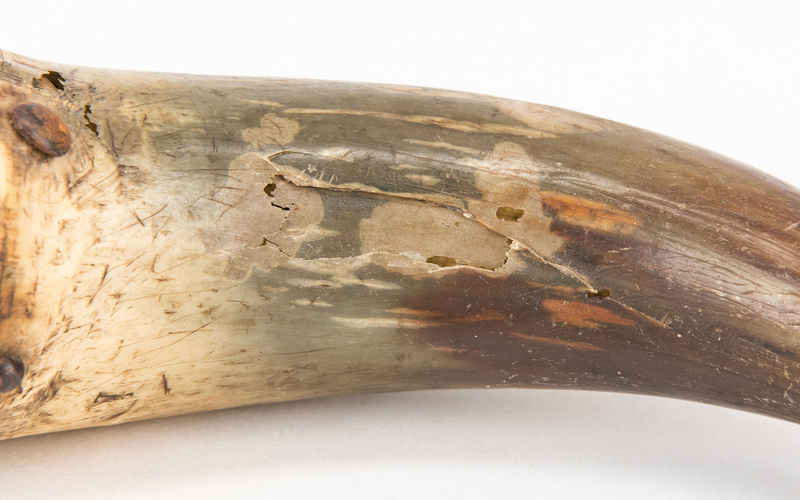 2nd-10th items: Areas of tarnish to buttons. All shanks present. 11th-19th items: All items with wear to be expected from age. 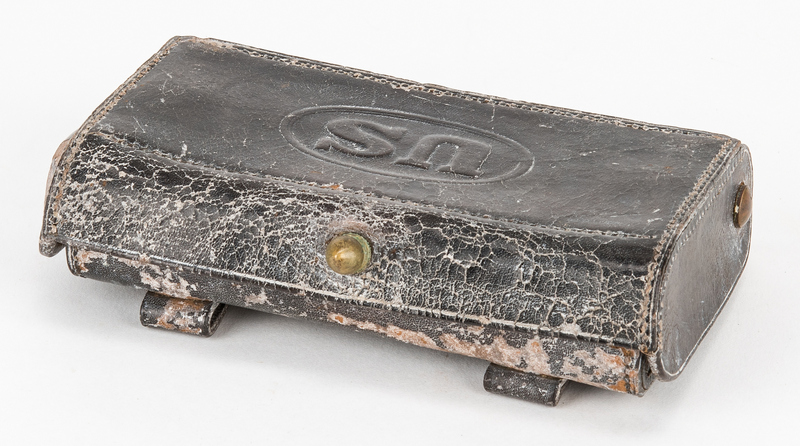 Bullet molds with rust.